Two gorgeous laptops, one choice that's best for most people. 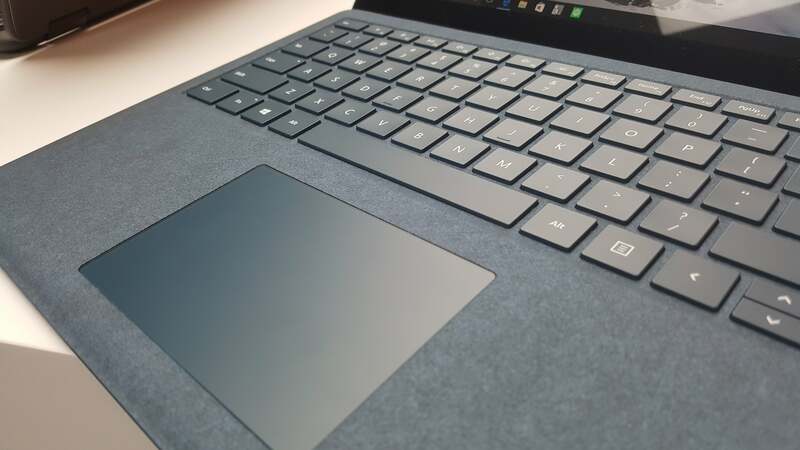 Living somewhere between Surface Pro 4 and Surface Book in Microsoft's line-up, the Surface Laptop would seem to offer an ideal balance between portability, performance and price. Updated July 20, 2017 with information from our review of the Surface Laptop. Check out the Performance section below for the bulk of the news, in our benchmarked speed and battery life tests. We’ve now tested the Surface Laptop, which is currently on sale from Amazon and other retailers. What we discovered when we compared the two is that the new Surface Laptop comes close and even surpasses the original Surface Book in terms of performance. What a difference a couple of years make! Let’s start by talking about what makes each Surface its own device. Remember that Microsoft first debuted the Surface Book in 2015, then refreshed it with the Surface Book Performance Base in 2016. The Surface Laptop is the most recent of the three, launching in June 2017. We reviewed a $1,299 (Kaby Lake) Core i5/8GB/256GB SSD Surface Laptop, comparing it to the two Surface Books we've reviewed: a $1,700 (Skylake) Core i7/16GB/512GB SSD Surface Book, plus the $3,300 Core i7 (Skylake)/16GB/1TB Surface Book with Performance Base. The Surface Book’s hinge allows it to fold...almost flat. Design involves more dramatic differences. 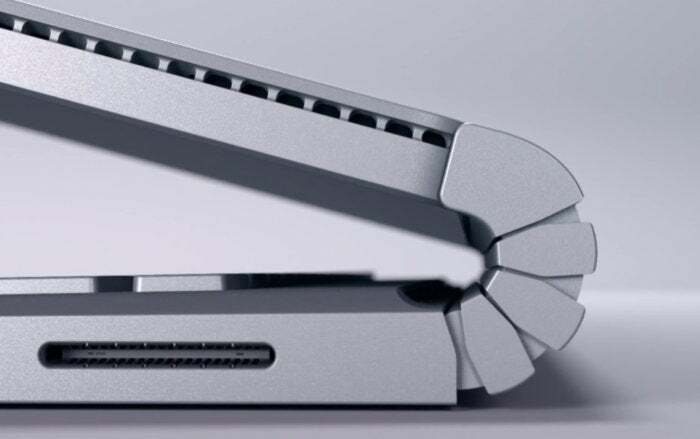 Because the Surface Book’s signature Dynamic Fulcrum hinge doesn’t fold flat, the Book can feel somewhat thick and clunky, especially compared to the Surface Laptop’s svelte 0.57-inch profile. Weight follows suit: Compared to the Surface Book with Performance Base (3.63 pounds), the 2.76-pound Laptop shaves off nearly a pound. The Surface Book’s advantage, of course, is that it’s a 2-in-1 whose display detaches to become a tablet. The Surface Laptop has no tablet option, not even a 360-degree hinge to enable a tablet mode. Habitual pen users should also be aware that the Surface Book includes a Surface Pen, while the Surface Laptop does not. The Surface Laptop reclines about as much as the Surface Book, but it can’t turn into a tablet like the Surface Book can. Newer components are one way the Surface Laptop shines. 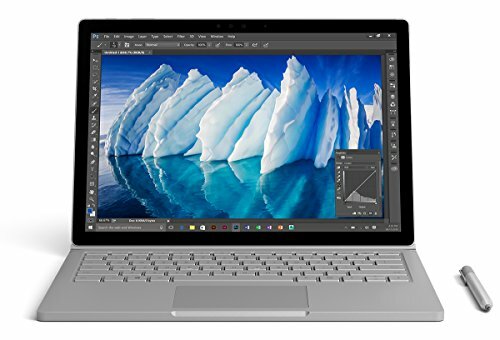 Microsoft’s Surface Book was originally built in 2015 and uses an older Skylake processor. 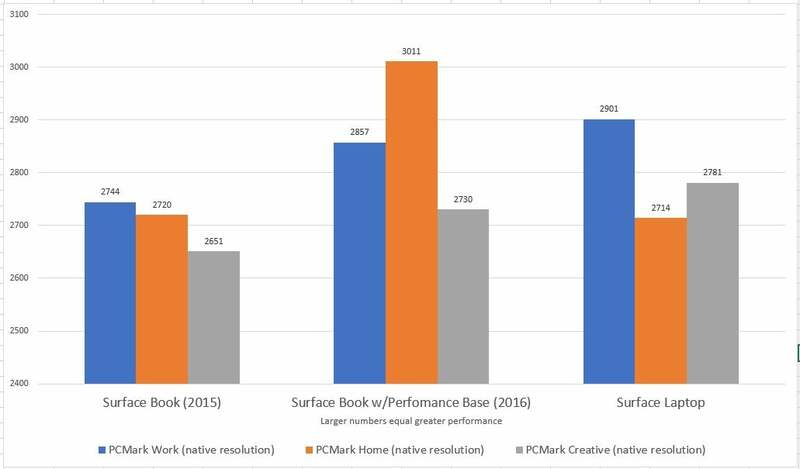 Microsoft’s 2016 Performance Base refresh affected only the discrete GPU. The Surface Laptop opts for Intel’s most current Kaby Lake chip, but graphics are integrated. Other corners cut on the Surface Laptop include smaller storage options and a lower-resolution display and camera. Finally, there’s battery life. Microsoft promises a whopping 14.5 hours of battery life from the Surface Laptop. 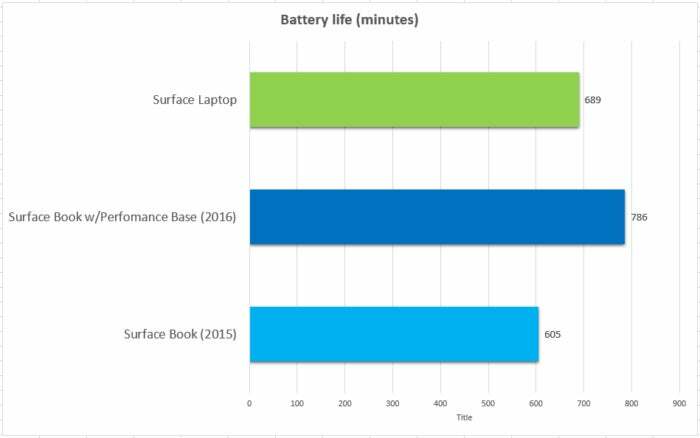 If you opt for the high-end Surface Book with the Performance Base, Microsoft promises even more: 16 hours. In reality, as our tests show below, the battery life is a little less. In either case, though, you’ll probably be a very satisfied customer. Although we haven't tested the two lowest-cost Surface Laptops, we'd advise against purchasing them. Their 4GB of RAM is barely adequate for today’s apps, let alone tomorrow’s. Collegiate life is about exploration, and skating by with 4GB of memory over the course of four years seems risky. For that reason, we’d recommend starting with the $1,599 Core i7/8GB/256GB Surface Laptop as your minimum option—yes, over the $1,299 version we tested. 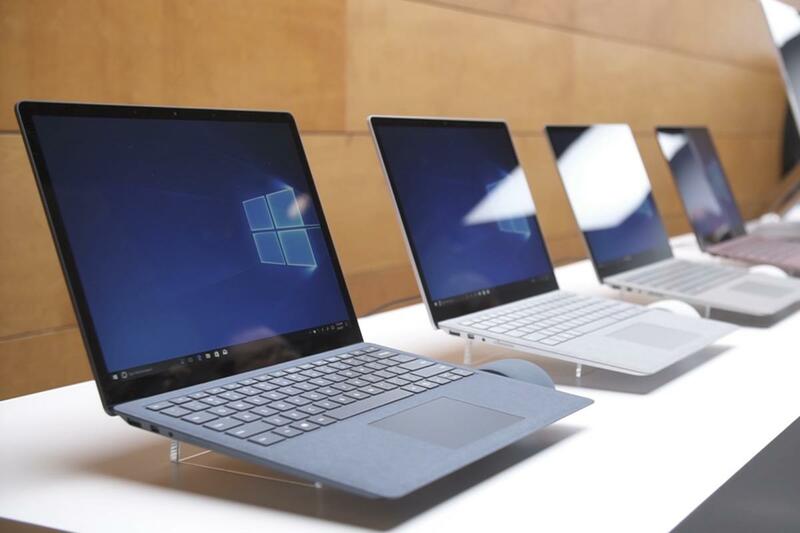 The $1,599 version is the one most comparable with the Surface Book, which offers 8GB of memory from top to bottom. Though there’s no version of the Surface Laptop that directly compares to the Surface Book, on paper the former seems to offer better bang for the buck. Consider the Core i7 (Kaby Lake)/8GB RAM/256GB SSD model of the Laptop: At $1,599, it’s about $800 cheaper than an “identical” Surface Book model. 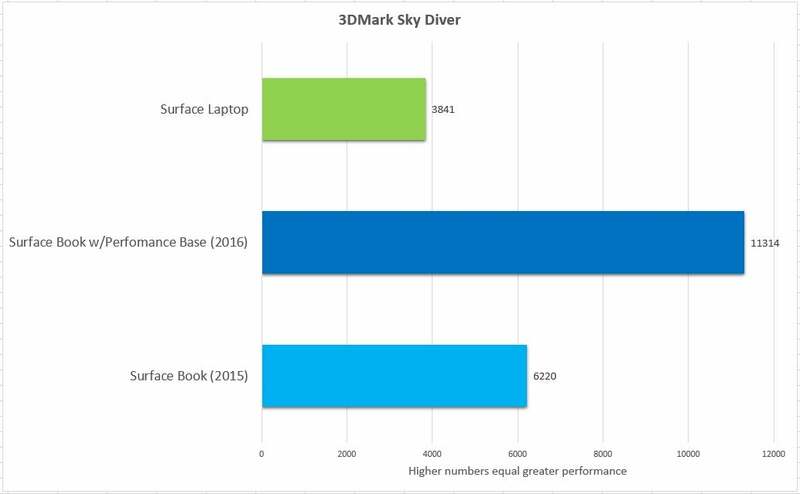 We’d vastly prefer that Surface Book because of its discrete GPU (something the Laptop doesn’t offer), but it’s also stuck with that older Skylake chip. The $800 difference is a ton. Both the Surface Book and the Surface Laptop feel solid in the hand, and can be supported by holding the base. Both feel sturdy and comfortable on the desk, as well as on your lap. 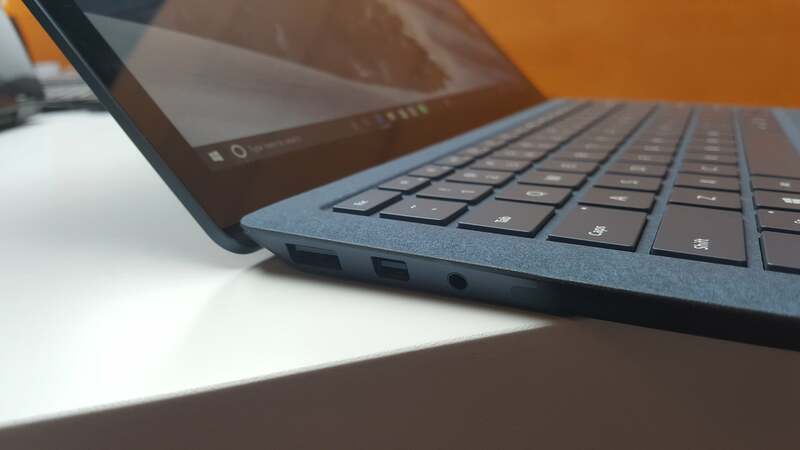 I have no issue with the Surface Laptop’s Alcantara-clad keyboard, which reminds me of the Surface Pro 4’s Premium Type Cover. The trackpad and keyboard on both are excellent. 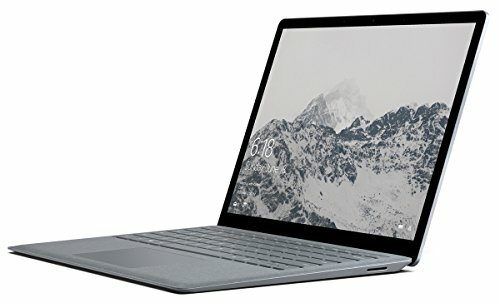 Microsoft remains committed to its Surface connector, which allows Surface owners to share chargers and connect to Microsoft’s Surface Dock. That accessory adds an additional four USB 3.0 ports, two miniDP ports, and gigabit ethernet—but it costs an additional $200, too. Fortunately, the Dock works with either device. Inking works well with the Surface Pen that’s included with the Surface Book, but you’ll have to buy one for the Surface Laptop. (Microsoft now sells an improved Surface Pen with 4,096 levels of pressure sensitivity and “tilt” support, allowing you to hold your pen at an angle to provide a broader stroke of digital ink.) Both devices also work with the Surface Dial, though you’re not able to use the Dial onscreen with either. You might think that the Surface Book, with its discrete GPU and emphasis on raw performance, would blow the Laptop away. And in some cases, it does. But steady improvements in the Intel Core chips and other components eat into the Book’s lead—and in some cases, surpass it. Case in point: the basic PCMark tests. We’ve combined the Work (spreadsheets and word processing), Home (some basic gaming, photo manipulation, and Web browsing) and Creative (photo and video editing, heavier gaming, and photo manipulation) to better show how all three devices compare. I know the Book with Performance Base blows the others out of the water in terms of Home performance, but the Laptop does very well for itself here. Part of that, I think, is due to the performance of the Kaby Lake chip inside the Surface Laptop. The Core i5 holds its own against the older Core i7 chips, making our Cinebench CPU rendering test as well as the prolonged Handbrake transcoding test a wash. Here, it’s not even close. 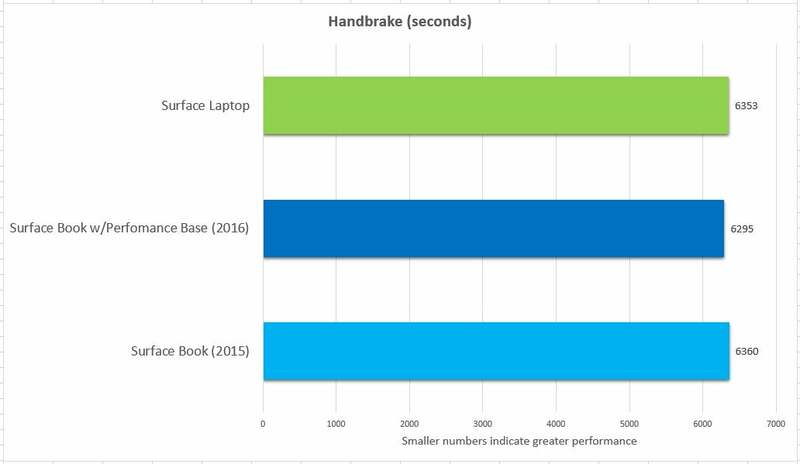 The Surface Book blows the Laptop away, as it should. But there’s the final metric: battery life. With batteries in both the tablet and base, you might think that the Book would again reign supreme. But the Laptop moved the speakers into the keyboard, freeing up some additional space for battery that the Book lacked. The result is closer than you might think. I never thought I’d be saying this, but 11 hours of battery life might just be the “good enough” threshold that you want. In any case, you can’t go wrong with either device. Choosing between the Surface Book and Surface Laptop may come down to price for most people, but the difference in my mind is simply 3D games. If you need the power of a dedicated GPU, you may want to pay for the Surface Book. Otherwise, the Surface Laptop does the trick. Granted, there are other considerations: a brawny vs. thin-and-light design, a feature-stuffed versus a curated configuration, and distinctive features like the Surface Book’s detachable display or the Surface Laptop’s Alcantara-clad keyboard. Clearly, the Surface Laptop offers a more up-to-date mix of components, an advantage the Surface Book could eliminate if Microsoft did a major refresh. 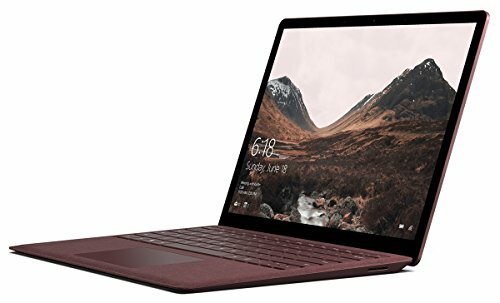 Unless you simply have to have the power of a dedicated GPU, I’d recommend the Surface Laptop as the superior machine. Not only is it substantially cheaper, but the performance differences are negligible. The Laptop’s battery life is within shooting distance of the Book, too. For now, Microsoft hasn’t indicated that the Surface Book will be refreshed anytime soon. And if it isn’t, you should invest in Microsoft’s Surface Laptop.